It's been a long cold winter. As we head into Mud season in the midwest [ hope it's a short one ] I'm planning shows for Spring and thru the year's end. I'm doing some more traveling and playing now that all three of my kids are out of the house. In fact, they are sometimes all out of state doing their own thing so I'm going hit the road more often. Where should I come play in your town? Last week, I played a for a fun crowd at a retirement party! I'd love to come play some of your favorite tunes and help you celebrate your birthday, wedding, retirement, new home warming, back yard BBQ, bar/bat mitzvah, engagement. I've got hundreds of songs to choose from and I can often be convinced to learn some new ones. Check back monthly for the updated calendar. Cheers and enjoy the Spring!! Starting with a stand-in harmony stint at the Fool's Flotilla in June, I've joined a group of merry music makers as their lead singer, the previous one having plans to move to England for a year. The band did one more gig on the first day of summer for Madison Make Music under the name River Rats. Next we will celebrate our love for an old Athens GA band. We have an R.E.M. cover show to play booked under the name aR.e wE. theM.? at the Cargo Coffee on East Washington in Madison. Confirmation for Saturday mornings at the Lakeside Coffee shop has come through. I'm no longer referring to it as Acoustic Coffee because I intend to work in more electric six string and lapsteel playing. When the weather turns cool you are invited to come get your weekend started with a hot drink, some fingerstyle solo guitar and songs. As always, it doesn't hurt to call ahead to make sure I made it in for the 930am spot. These early mornings are not easy alongside the musician's night owl habits. That's the short of it for now. Also, the seventeen year old finished HS in style and is making his way forward into the musical world. The Acoustic Coffee Hours continues for it's [ amazingly ] 9th season on Saturday mornings at the Lakeside Coffee House. Along side some relaxing steel string guitar solos, I sing a few songs and try not to talk too much; becomes a bit of a challenge to reign myself in after a few cups of their fresh brew. Tim Haub told me last weekend that he almost stopped in to to add some side-mandolin last Saturday but opted for hitting the snooze button. He's probably due to make an appearance soon. Coming up in February I'll make my second appearance at the Fired Up Pottery. Imagine listening to great acoustic guitar music and songs [humble brag] whiles shaping your pottery masterpiece! They also offer painting on canvas and glass. I'll be there Friday February 9, from 7-9pm. Another return gig: The Jeweler's Edge hosts fantastic parties during the Baraboo Wine and Beer Walks with a full catered spread by Elite Catering. 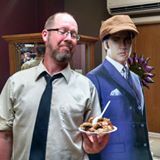 Below you'll see a pic of Me and Elvis [and our Biggest Fan] enjoying a plate of desert at a past event. I'll be playing and singing in their space on May 4th, so of course the theme for the evening will be Cinco de Mayo. Finally a chance to play my favorite Los Lobos tunes! New stuff: working up another guitar duo, this time with my son Zane. He's been gigging weekly at the Mt. Zion Baptist church in our neighborhood; the skills he's developed in funk, rhythm and blues are something to behold! We'll keep you posted on shows. Thanks to Madison Early Education Teachers and Joan Hentschel's family for having me play their private parties in December at The Lakeside and in their home! Contact me directly to inquire if you'd like some music for your next big thing! Wow, a lot of time has passed since my last blog post. Let's try to account for lost time. I'm no longer playing with the band Fauxtons but you can check out my last endeavor with them, playing bass and singing on the six song EP called THE FAUXTONS INCLUSIVE OR. The Mugs continue to play their folk rock country blues blend of harmonica, guitar and mandolin driven songs. Tim Haub, Frankie Lee and I will be playing a show at Lakeside St. Coffee House on April 15. Come celebrate your big return or let the music salve the sting of a payment due. It's an early show 630-9pm. Suggest donation of $5 to pay the band. 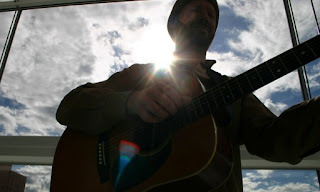 Other Lakeside St. Coffee House news: I'm in the midst of my 5th season [ if I count rightly] of my Acoustic Coffee Morning Mood sessions on Saturdays from 930am to 11:30am. I play from my repertoire of solo guitar music, sing a little and talk not too much. Come study, socialize and, of course, enjoy your morning brew with a little acoustic guitar music. Still more LSCH [ I'm there a lot ]; my regular Thursday night bar shirt there has been including an occasional Open Mic. There are talks with the owner about making it a more regular event. Current Thursday night events include a Paint Night https://tinyurl.com/gw6kthv most Thursdays. There is a Uke Night on the 2nd Thursday of the month. Stop in to say Hey Barkeep! First: This past fall I started playing in an eclectric acoustic electric trio with Frank Lee and Tim Haub. Frank is an accomplished blues harmonica player and Tim is THE reliable lead guitarist with many regular Madison Americana bands including Dollar Bill and the Bucks and the now retire Jim James and the Damn Shames. We take turns leading songs and trading vocals and harmonies. Frank's selections are rooted in blues styles, Tim's are a little more country, and mine are a mix of classic singer songwriter with originals. We have our first gig under our collective belt, having played for Tyrenena Brewing Company's 15th Anniversary Party under the name The Frankie Lee Trio. We'll be playing next under the new name Three Eclectic Mugs. Second: The Fauxtons [Spring/ Summer/ Fall 2014 blog for details] are back in the Howling Hicks basement studio preparing to play the annual Benefit for McArdle Cancer Research Laboratory. January 23rd we'll play from 6-7pm at Gray's in Verona. The last couple of practices have been inspiring and there is talk of recording an album of Fauxton sonic wonders! The last of BANDS BANDS AND MORE BANDS: An official HeadStock Music Studio-only group of rag tag players. This group is so loose they are letting me handle the drums and percussion division of their merry music making. We call ourselves The Groovenatorial Privilege. You aren't likely to see us play anywhere. Unless you one of the "fortunate" invites to the Higgs family barbeque this summer. I'm back at the Lakeside Coffee House on most Sunday mornings from 9ish to 11:30ish for as long as the weather is chilly and people are inspired to spend their mornings indoors sipping something warm. I'll be playing solo fingerstyle guitar with just a few quiet songs added. Come enjoy an Acoustic Coffee morning while those winter winds blow. All for Now! Now for All! THEmichaelgruber.com - accept no substitutes. A new band side-project, The Fauxtons, started playing out in early winter this year and has continued to gig in exotic locations such as Ft. Atkinson and The Great Taste of Madison. Featuring German Art Student Annelies Howell as lead singer/guitar, two Bing Bongers - Danny Hicks on lead guitar and Brian Bentley on drums, and THE michael gruber on bass and harmonious vocals. We don't have gigs to announce but we do have plans to do some recording in this winter. If you come see me play somewhere ask for a Fauxtons sticker. The secret passphrase is... " Fauxtons; sometimes a particle, sometimes a wave, always real." One of my favorite music venues, Lakeside Coffee Room, caught some flack from silence loving neighbors this summer. They were issued a cease and desist from all amplified music on the premises until things get sorted out with the city. Manager Kate Burmeister is reported to have identified [evil ] wedding dj's as being the problem and has vowed to banish them from all future events at LSCH. Still awaiting word from the city on allowing amplified musicians to resume their much beloved performances. YOU can visit the Lakeside to sign a petition in support or write the Alder directly and ask the issue be brought up for discussion at the Common Council. Returning to the Canadian Honker, in my home town Rochester, MN, this month and again in December. I had some fun this summer playing with Jim James and the Damn Shames at the High Noon Saloon and The Tyranena Brewing Company. Though there was some talk of continued playing and even possibly recording, there remains no news to share. The Sugar Daddies played what has become an annual event in the backyard of a couple of our first fans. John and Dorene know how to throw a shindig and Andrew and I much appreciate them for having us back. Looking forward to the third annual event. Also of note, The Sugar Daddies' version of one of my songs tied for second place in the Green Shoe Recording Studio songwriting contest. The video I submitted isn't very well shot so I know they must have like my song. You can see that video here. Coming up: I'm looking forward to sharing a gig with Madison Blues legend Jim Schwall. I was fan of his playing in the Siegel- Schwall band before I met him, I even have a couple of their long ago issued vinyl albums. This is a treat to get to play at his regular third Friday show at Chief's in Madison. More music project in the works with Madison musicians. Stay tuned for the news. Last Month of Coffee Music! cozy room with a view of Wingra Bay. monthly Brink Lounge show. I'm hoping she'll invite me to sit in on a couple tunes with her band. this will be a solo performance. that feeds your artistic expression. - that is cool too. Playing here for the first time. Damn Shames & Groovin' Brothers. sit in on a couple tunes with her. Details: Tonight's music with a special guest sitting in on lead guitar. Details: Thanks for coming for the brew and staying for the tunes! Watch for next season's return! cozy bay side room with a view. Details: Frankie Lee- harmonica & vocals, Tim Haub- guitar, mandolin & vocals and Michael Gruber- guitar, bass & vocals present their blend of folk rock country and blues originals and classics! The Mugs will play two songs from the Beach Boys classic album along side s plethora of Madison musician talent. The evening will feature the songs from the entire Endless Summer and Pet Sounds albums.